So, I started this Sims1 site so long ago, I don't remember exactly what year it was. 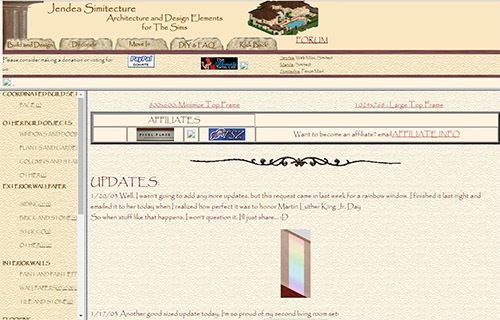 According to the Wayback Machine, the first screen capture in the Web archive is July 2002. I'll go with a little before that, because I had already updated at least once and was a member of a webring (remember those?). By 2003, the iframed site was coded (complete with Papyrus font!) and Manda was already on staff. As a final word, I would like to express my appreciation for all those who donated their time and money to making this site happen. In putting together the archive, I was once again overwhelmed by the talent and creativity of the people who were staff Simitects. Thank you so much for making Jendea Simitecture your home: you guys really rocked! To the visitors and generous donators, thank you also for your encouragement, your emails, your forum participation and of course for downloading and using our things in your sims games! Original textures, articles and art by jendea copyright 2002-2017 Jen Carr. Other original art is copyright 2002-2017 by the creating artist.